Offering unparalleled scope, A Companion to Hellenistic Literature in newly commissioned essays explores the social and intellectual contexts of literature production in the Hellenistic period, and examines the relationship between Hellenistic and earlier literature. Provides a wide ranging critical examination of Hellenistic literature, including the works of well-respected poets alongside lesser-known historical, philosophical, and scientific prose of the period. 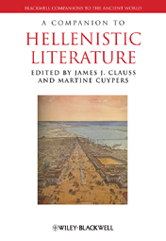 Explores how the indigenous literatures of Hellenized lands influenced Greek literature and how Greek literature influenced Jewish, Near Eastern, Egyptian, and Roman literary works.